At Komunal88, since we are food enthusiasts, we care for the environment, because food (good food, that is…) isn’t manufactured or synthesized, it’s grown, raised, harvested from nature. We try our best to reduce our footprint on the city and by extension on the environment. Since many of the products we use and retail are shipped internationally, we already have a significant carbon footprint that we want to offset by other means. For instance, we use silicon placemats to avoid unnecessary use of paper; we provide cloth napkins for the same reason; our water is served and sold in glass bottles and sustainable wooden crates. We do what we can to reduce the use of plastics as much as possible. We want to enlist you in this quest and behavior, but we will be returning to you the benefit of what we know is an extra effort. We do not use disposable cardboard and plastic cups. For your takeaway drink order, we ask you to purchase at a very reasonable price* a double-walled ceramic tumbler that will become your coffee companion at home, on the road and in the office. That’s your part, that’s all you have to do. 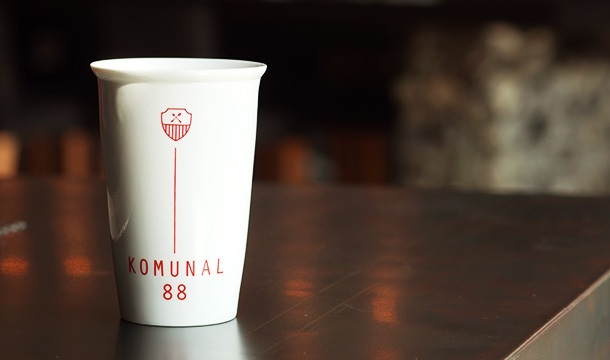 From that moment on, including with your first purchase, every time you will bring your Komunal88 tumbler, your takeaway drink will be half-price… That’s on us, for the good of the planet humanity**. Easy enough? *From the third Latte you’ll be making money with your tumbler. ** The Earth doesn’t need saving. It’s been here long before us and will be here long after us. It’s humanity that needs saving from ourselves.